Ineda Adesanya served as Project Planner for this (700+ final phase) new home community, and as the primary contact for Site Development and Design Review. This project included a controversial, developer-built new elementary school with extensive inter-agency coordination. IPA was retained to obtain permits and entitlements for a new custom, hillside home to be built in Castro Valley. 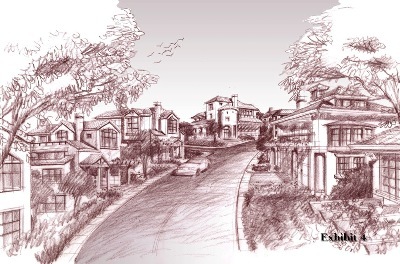 Skyline Terrace Estates is a 13.6-acre planned development consisting of 22 custom single family homes in the Oakland Hills. The project will involve construction of a private access road and an emergency vehicular access road, as well as all utilities (water, gas, storm sewer, sanitary sewer, and power) to serve the twenty-two homes. The development will include both upslope and downslope houses varying in size from 4,000 to 6,000 square feet. The primary access road is approximately 1,400 feet long, and includes a vehicular bridge crossing over an existing creek. The emergency vehicular access road will be along a portion of the currently undeveloped York trail. As a benefit to future residents and the community at-large, the York trail will be further developed by clearing and grubbing existing overgrown vegetation to create pedestrian access to the improved trail adjacent to Merritt College. In addition, these improvements to the York Trail will specifically implement policies and objectives on the OSCAR element of the City’s general plan regarding priorities for trail development and improvements particularly linking existing parks together. Approximately 6.67 acres of the 13.6-acre site will be permanently dedicated as open space. The project is located to the west of Skyline Boulevard approximately 1.5 miles southeast of Redwood Road and 2.0 miles northwest of Keller Avenue, in Oakland, California. The project site lies almost directly across from Oakland Fire Station #21 on Skyline Boulevard, and the Park Ridge Drive intersection.